At Short Pump Dental, we believe everyone deserves a beautiful, healthy smile. As a leading dentist serving the Short Pump, Glen Allen, and Richmond, VA areas, we're proud to offer a wide range of dental treatments ranging from general and preventive care to restorative procedures like dental implants. If you need to replace a missing tooth or want to replace a tooth to improve the health and appearance of your smile, dental implants offer one of the best ways to do it. 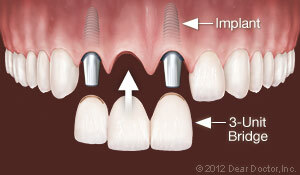 Dental implants are an effective, convenient, and long-lasting option for replacing teeth. Implants are made from a small screw-like titanium post that's inserted into the socket left by a tooth, then covered with a lifelike dental crown. Once placed, implants are virtually indistinguishable from natural teeth, and they can last a lifetime with proper care. Even more importantly, dental implants possess the unique property of osseointegration: because the implant itself is made from titanium, it literally fuses with the jawbone. This works to evenly distribute bite pressure throughout the jaw and guard against bone loss, which is one of the lesser-known consequences of missing teeth. Implants are placed using a minor surgical procedure. During this procedure, your Glen Allen dentist will place the implant into the socket left by your missing tooth, then cover the implant with a temporary crown. The implant is then left to heal for a few months, providing time for the bone to fuse with the implant. Once this process is complete, your Richmond dentist will replace your temporary crown with a permanent crown that's custom-made to match your natural teeth. 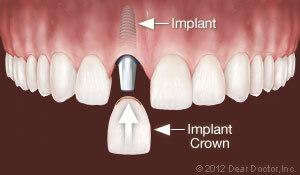 Replace a Single Tooth: If you're missing a single tooth, we can replace it using one dental implant and one crown. Single-implant replacements have an incredibly high success rate, making them an excellent investment in your dental health. With proper oral hygiene, your implant will last you the rest of your life – and because we can custom shape and color match implants to perfectly fit your existing smile, your implant will look virtually identical to your natural teeth. Replace Multiple Teeth: If you're missing more than one tooth, there are a number of options available to you. While we can use one implant to replace every tooth, we can often combine replacements to reduce the number of implants needed. By using implant-supported dental bridges, we can replace 3 or more teeth with just two implants, providing an efficient and cost-effective treatment option. 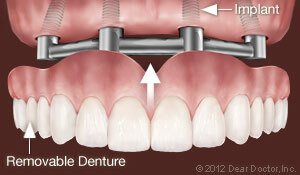 This also prevents needing to use natural teeth as supports for a dental bridge, which can weaken them. Implant-Supported Permanent Dentures: If you need to replace all of your teeth on the upper and/or lower jaw, dental implants are an excellent repair option. 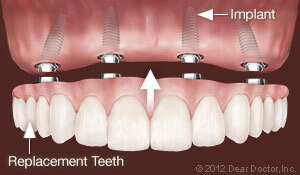 We can use implants to replace the entire dental arch, providing you with a permanent set of lifelike teeth. Often, we can use as few as 4 implants to replace each dental arch, although we may need to use more depending on the health of your jawbone. In any case, replacing your teeth with implants will provide you with a new smile that looks natural, will never slip, and will last you the rest of your life. Implant-Supported Removable Dentures: Even if you'd still prefer removable dentures, we can use implants to improve your treatment. Using implants to support removable dentures can help to distribute bite pressure in a healthier way, preventing the bone loss that can come from traditional dentures. This is because traditional dentures rest directly on the gums, putting bite pressure downwards on the jawbone. Over time, this causes the jawbone to deteriorate. Implants, however, distribute bite pressure throughout the jaw, protecting it an preventing bone loss. Thankfully, maintaining your dental implants is remarkably easy: just treat them like you would your natural teeth! Brush and floss your implants on a daily basis to keep them clean and keep your gums healthy. In addition to oral hygiene, it's important not to use excessive pressure when biting down, as this can damage the implants. So long as you have a sufficient number of implants, though, bite pressure is rarely a problem. With conscientious care and regular oral hygiene, your implants should last you a lifetime! Dental implants offer one of the most effective, natural-looking, and long-lasting options for replacing teeth, and if you think dental implants may be right for you, we'd love to help. Contact us today to learn more about dental implants or to schedule an appointment with your Short Pump Dentist. We can't wait to hear from you, and we're excited to help you achieve a beautiful new smile!